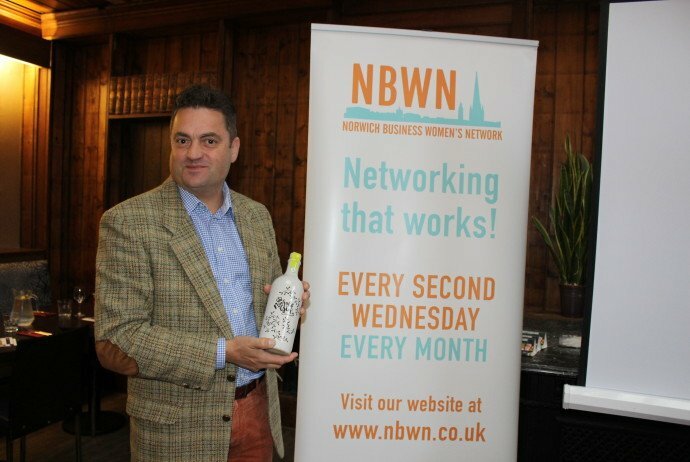 In October our guest speaker at The Library was Jonathan Redding from Norfolk Gin. Originally from Gloucestershire, as a teenager he ‘walked out one midsummer morning’ and joined the Army and enjoyed a long and varied career, leaving as a Major in 2001. He then entered a career as a HR professional for several years in industry, government and local charities. In 2014, he decided that he needed a new challenge and came to Norfolk where he started his own gin business after deciding that the ale market was already well served in the area. He wanted to create something that was distinctly gin but with a twist and after experimenting (on friends and family!) with every flavour under the sun, settled on what is now Norfolk Gin, a unique taste which sits equally well with Fevertree tonic as it does pink lemonade! Of course, we were all able to indulge in a sample or two which made for a really unique NBWN lunch experience. In short, an entertaining speaker and networking event which inspired me to nip down to Brian at Harper Wells (the first local shop to stock these eye catching bottles) to pick up one for a Christmas present!